Grazing Management Systems Pty. Ltd. uses a highly developed process to grow and harden the Oldman saltbush seedlings. Our seedlings are always grown using procedures with a final view of maximising seedling strength for field transplanting. We are not interested in how fast we can grow a plant in the nursery: fast grown plants are "soft" and are not ideal for transplanting in the majority of rangeland conditions. To have optimal seedling strength, it is necessary to grow the seedlings in the nursery for 6 to 8 months. We use our own special propagation trays for growing them. Many years ago we learnt that it was critical to have a plant with a longer/deeper root than was then common in the nursery industry. 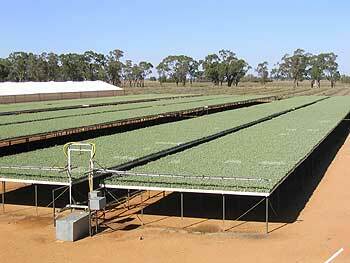 As a result, we now use these growing trays that have been developed especially for Oldman saltbush. These trays allow us to grow plants that have an appropriate "root to shoot ratio" of 1/3 root to 2/3 shoots. Experience has shown over the years that plants with this important ratio do better in the field and can tolerate moisture in a superior manner. The hardening process occurs during the last 2 - 3 months in the nursery. By utilising a combination of fertilizer, moisture and outside growing, we are able to produce a strong, robust seedling that can handle considerable stress. Our plants are grown "slow"; this gives them remarkable strength and - importantly - has allowed them to develop the necessary bud wood prior to field planting. To have bud wood develop in the seedling is critical as it gives the plant the ability to tolerate even greater transplanting stresses in the field. When you use our hardened plants, you can expect an establishment rate in the order of 90% or better. With our management techniques for establishment applied to your Oldman saltbush planting project, you have an excellent probability for a high level of success. Critically, if conditions are not suitable for field establishment of Oldman saltbush on your property, we will not deliver the plants: instead, we will hold the plants in the nursery until your field conditions are suitable. Finally, we are often asked as to why we choose the seedling method, as opposed to direct seeding. After many years of experience, we have concluded that using seedlings is the optimal, cost effective way to permit Oldman saltbush grazing solutions to be viable. For a number of years, we experimented to see if direct seeding of Oldman saltbush was a viable option, but found that our results were - at best - a hit and miss affair. More often than not, we experienced total failure - a result that is common to the vast majority of landowners who are still experimenting with direct seeding. Because of this, the true cost of direct seeding is in almost all cases much, much higher than seedlings. Oldman saltbush inherently has a low germination rate, but we have found that the main problem for successful direct seeding is caused purely by the plant's physiology. It is simply a slow developer; to have any real chance of success with direct seeding, you need optimum growing conditions in the field for at least 3 months - and preferably 4 months. As many would testify, this is a very rare event in Australia. In the nursery, even we face considerable challenges in keeping the plants alive in what is a well controlled growing environment. Rest assured, our choice of seedlings is one based on many years of experience and the best scientific knowledge available: it is this combination that will ensure your successful Oldman saltbush project outcome.